Tropic Eden Bacterioplankton - 8 fl.oz. CLICK HERE to see full color ad, opens a new browser window. 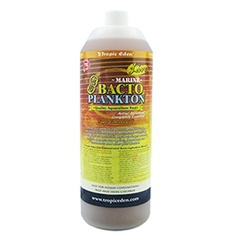 Tropic Edens live concentrated bactoplankton is a special blend of more than 15 species of bacterioplanktons from 0.2 - 2.0 microns which ensure optimal result for a wide range of feeding requirements. It is rich in a wide range of bacterial enzymes, amino acids, vitamins, and essential micronutrients, and is the critical foundation of food source that supports many other higher life forms in the food chain of the natural coral reef. Bacterioplankton Plays an Important Role in the Recycling and Remineralization of Nutrients and Minerals in Aquatic Systems. Major Food Source for Wide Range of Invertebrates and Filter Feeders such as Sponges, Fan Worms, Tunicates, Bivalves, as well as Corals Including Acropora, Montipora, Pocillopora, Seriatopora and Stylophora. Essential in Keeping Non-Photosynthetic Corals and Difficult-to-Feed Species (e.g., Gorgonian sp., Dendronephthya sp.) that Mainly Depend on Filter Feeding of Planktonic Food! Critical Food to Larvae which in turn are indispensable Food for Corals and Filter Feeding Organisms. Free-Floating Forms Easily Caught and Consumed by Filter Feeders. Does Not Sink to Bottom, Die and Decompose Easily. Greatly Enhance the Coloration of Corals and Invertebrates! Cultured with Strains of 100% pure Research Grade Media Treated with Three Major Steps of Strict Sterilization Procedures including UV Radiation and Ultra High Pressure Treatment. Live Bacterioplankton Takes up Ammonia, Nitrates, and Excessive Carbon Dioxide as Their Food Source which Makes Them Very Efficient and Natural Water Purifiers. Helps Keep Water Clean and Low in Dissolved Nutrient! Live Bacterioplankton is Much More Attractive to Consumers Than Dead Ones. Promotes and Induces Spawning and Spatfall (Settling of Larvae)! Significantly Increase Survival of Larvae of Corals and Other Marine Organisms! The Critical Food and the Missing Link to Culturing Larvae of Coral and Marine Organisms! Enriched with Full Spectrum of Essential Nutrients. All Contaminants and Excessive Nutrients Excluded. Shake well to bring settled bacterioplankton back to suspension before use. Then pour bacterioplankton in area with good circulation of current. Alternatively, use Tropic Edens special feeding apparatus for target feeding of bacterioplankton. 30ml (1 fl.oz.) per 100 gallons/378L. Gradually double the amount for feeding mature and dense population. Increase feeding amount gradually in two weeks of time. Feed accordingly. Shake before use. Recommended frequency: At least every other day. Bacterioplankton density for feeding light to average population: ~3 million cells/ml. Bacterioplankton density for feeding dense population: ~6 million cells/ml. 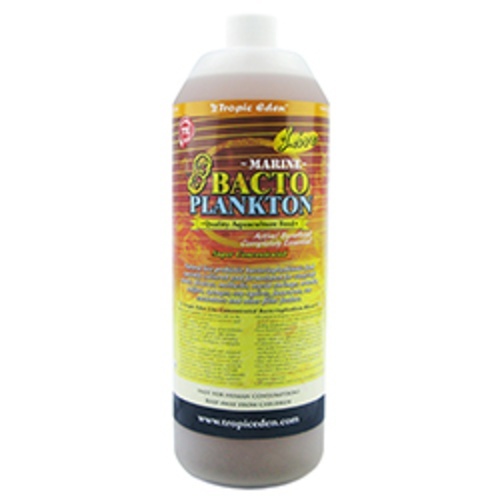 Tropic Edens Premium Blend of Live Concentrated Marine Bacterioplankton is qualified to be live and active for six months under refrigeration from the date of packaged. Keep refrigerated at around 4 Celsius. Do not freeze. Gently shake bottle to bring any settled bacterioplankton back to suspension in every few days.